72' Cheoy Lee Motor Yacht ILLIQUID Cheoy Lee Yachts was founded in 1870 and is still owned by the same family 148 years later. 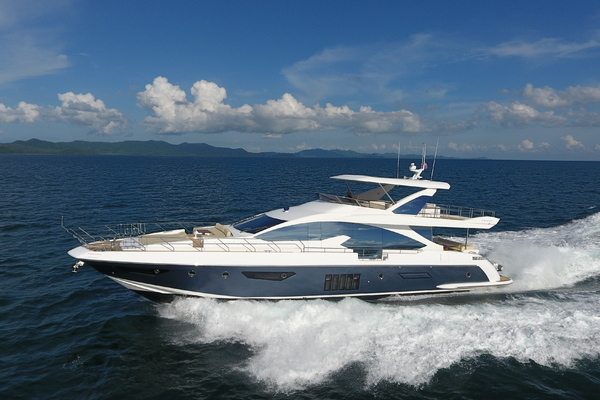 Currently yachts are only part of the overall business of Cheoy Lee, building many types of commercial vessels, such as tug boats, patrol boats, fishing and utility boats. The commercial heritage of these work boats is obvious in the engine rooms of all Cheoy Lee yachts built today.This 72' Cheoy Lee yachtfisherman was built for a boater who wants the cockpit of a sport fish with the amenities of a motor yacht. A big low to the water cockpit with ice chipper and baitwell has a removable sun shade for fishing time but shade for cruising. 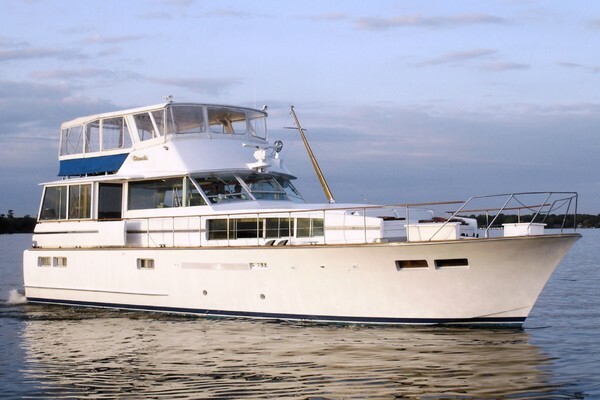 The deck is synthetic teak and there is no exterior varnish to keep maintenance easier.Three staterooms with ensuite heads plus two crew cabins give plenty of room for family and guests and the big galley makes feeding them easy. The flybridge has a full recent enclosure. United Yacht Sales New Jersey would love to guide you through a personal showing of this 72' Cheoy Lee Yacht Fisherman 2004. 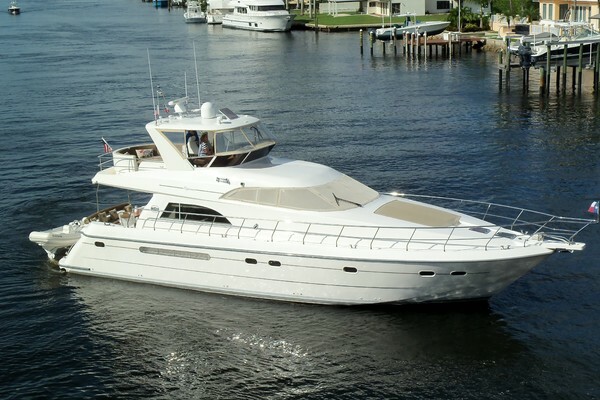 This yacht for sale is located in Fort Lauderdale, Florida and priced at $975,000. For a showing please contact us by filling out the form on this page and we will get back to you shortly! The main salon is entered from the aft deck through a stainless framed sliding glass door. To starboard is a built-in "U"shaped couch with ample storage below. More storage is available in the custom cubes that fit to together to make a "coffee table" or ottomans. Across from the couch is the entertainment center with the television on a lift to stow away out of sight. Forward of the television is a day head, a wonderful convenience for guests rather than going below decks. The floor of the salon has been updated recently with Amtico engineered wood flooring for a clean look and ease of care. As with most Cheoy Lee yachts, the windows are large to let in natural light, and low enough for a great view out when on the couch. The side decks are covered walk around decks, so that there is a of sun shade from the covered decks and the shades do not need to be drawn all the time to keep the sun and heat out. For privacy or to keep the sun out, the windows have pleated box shades. The galley is forward a few steps up to keep it separate from the salon. The flooring is the same Amtico synthetic wood for a warm look with ease of care. The counter tops are dark granite, with natural cherry wood cabinets and updated stainless appliances and sink. There is a large window over the sink to brighten the area and give a great view when in the galley. The kitchen is "U" shaped with a forward counter to divide the area from the dining area forward to port. The couch seating has plentiful storage below the cushions. A curving circular stairway, a work of art in curved wood and stainless steel, leads to the flybridge so there is access to the bridge both from the aft deck and from the galley area. A black leather Stidd helm seat gives a great view for operation underway at the lower station. A full complement of electronics allows the skipper to run this yachtfisherman in any weather. There are doors from the pilothouse to both port and starboard side decks for ease of docking and line handling. Stairs lead down to the cabins from the helm. Access to the staterooms is from a curved carpeted stairway from the pilothouse. Forward is the VIP stateroom in beautiful gloss woods with padded vinyl panels to keep the stateroom lighter, with a large hatch overhead for natural light. Storage cabinets to port and starboard at head level plus under the queen berth gives room for extended cruising. The ensuite head has black granite countertops with white and black tile floor. The stall shower has a bench seat. This stateroom has three single berths, one to each side as typically seen, plus a third berth over the headboard area to give the most versatility. If there are only two guests the third bunk makes a great catch-all area for fishing gear, dive gear and beach clothes, if the extra room is needed the extra bunk comes in handy. The ensuite head has the same black granite counter top and a stall shower. The flooring is also white tile with black diamond shape tile inserts. The master stateroom is full beam, midship, for the most comfort underway or on the hook. The center-line walk around berth is king-size with storage below. There are two good size cedar lined closets with a safe in one. To starboard is a high-top dresser and to port is storage with an additional single berth for a child, or a place to stow some cruising gear. It would be a simple conversion to change this to a high-top dresser with a dressing bench. The ensuite master head has a full-size water jet tub plus a separate stall shower. The counter top is black granite and the flooring, like the other cabins, is white tile with diamond shape black tile inserts. Access to the engine room is from a door in the cockpit so that mechanics and crew do not have to go through the stateroom areas. There is an emergency access hatch from the master stateroom however. Going into the engine room which is clean and bright there is a scuba tank filling dive compressor mounted to starboard, with the water maker aft. Twin 20kW Northern Lights generators in sound shield enclosures are mounted with easy access to both sides. The Caterpillar C-18 engines are forward, and they also have good access to all sides of the engines. There is a watertight bulkhead door leading to the crew quarters with two separate single berth cabins. There is a separate shower stall and separate head. Both cabins have televisions.